Last Saturday, I shook off my headache (self inflicted from one too many wines the night before) and headed over to The Real Eating Company in the centre of Bournemouth for a breakfast event with the Bournemouth Bloggers. It isn’t often I go out for breakfast, and I rarely meet up with friends specifically at this time of the day, so it made for a nice change. I was joined by a fantastic group of women, and we were chatting away for a couple of hours whilst being treated to freshly squeezed orange juice, baked croissants and a delicious cooked breakfast made to order. I don’t drink hot drinks, but the rest of the girls also enjoyed teas and coffees, which looked fantastic. The venue is a little tucked away down a side street, which was shut off to traffic recently, which makes it a bit of a hidden gem away from the hustle and bustle of the town centre. As well as the cafe we visited, there are branches in Chichester, Portsmouth, Horsham and Salisbury, as well as second venue in Bournemouth, up in the triangle. The Real Eating Company are passionate about supporting small, local producers, and take pride in nurturing business relationships with these smaller brands, without compromising in the quality of their food and drink. Owner and founder, Helena, is totally involved in the business and was there with us at the breakfast, talking us through the business ethos, and taking a real interest in our own stories whilst telling us about her own. The Real Eating Company offer light snacks, sandwiches, and toasties, but it is their breakfast menu, served all day, which is the highlight of their menu. 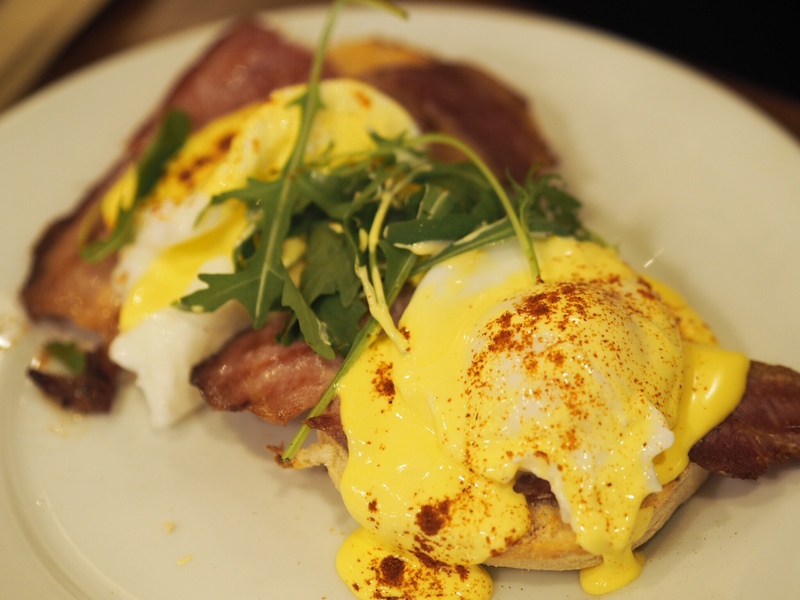 With classics such as the full or half English, alongside old favourites Eggs Benedict and Florentine, there are also some modern twists including the totally instagrammable Avacado Eggs Benedict. The food was totally yummy, but I would definitely recommend you go for the half breakfast as I struggled to finish mine! I loved the orange juice as well, it was so refreshing and definitely helped perk me up and had me feeling better. I’ll be going back soon to try out their toasties, and to sample some of their delicious freshly baked cakes as they looked incredible! We were invited along by The Real Eating Company and provided with a complimentary breakfast for the purpose of this review, however all opinions and images are my own.